An RCMP officer in North Vancouver was taken to hospital with minor injuries Saturday after being struck by a motorcycle at a traffic stop. North Vancouver RCMP says uniformed officers were on Highway 1, west of Westview drive around 2:50 p.m. PT conducting traffic enforcement when they flagged down a black sport motorcycle. Police say the person driving the motorcycle, initially stopped, but then accelerated, hitting an officer and knocking him to the ground. Officers say the motorcyclist then fled west on Highway 1. The struck officer was taken to Lions Gate Hospital to be treated for minor injuries. 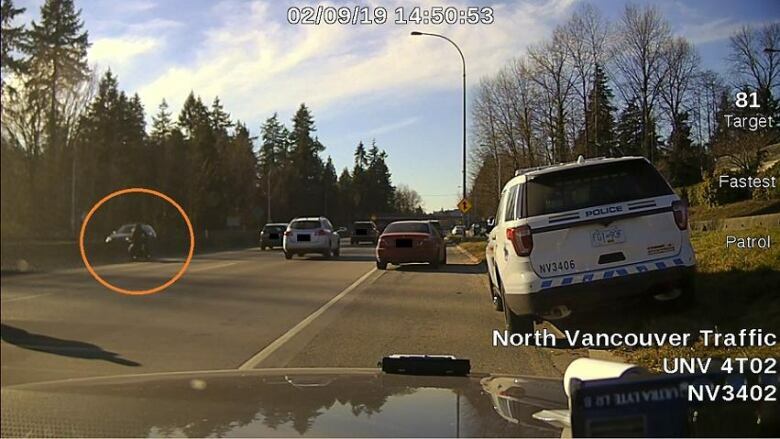 ​Police are asking that anyone who may have witnessed this incident to contact the North Vancouver traffic services at (604) 985-1311, especially if they have dash-camera video that might have captured the collision.